SEATTLE – One day after breaking up a no-hitter in the ninth inning, Mitch Haniger drove in four runs Wednesday afternoon and helped the Mariners close out a successful homestand with a 10-5 victory over Miami. Kyle Seager also had four RBIs as the Mariners bailed out a shaky Felix Hernandez and completed a 6-3 homestand that effectively resets their season after a dreadful 1-7 start. A balanced attack produced nine runs by getting 11 hits and drawing 10 walks in a nice recovery from Tuesday’s 5-0 loss, when the Mariners didn’t get a hit until Haniger’s one-out double in the ninth inning. Hernandez (2-1) wasn’t sharp. He put the Mariners in a quick hole by surrendering two runs in the first inning and never appeared to find a comfort zone. In all, Hernandez gave up 12 hits, including booming homers to Giancarlo Stanton and Christian Yelich. Even so, the King pitched into the seventh before turning over an 8-4 lead to Tony Zych with one on and one out. Zych walked Stanton before getting Justin Bour to ground into a double play. Nick Vincent, Evan Marshall and Marc Rzepczynski closed out the victory. There was drama in the final inning when long-time Mariners outfielder Ichiro Suzuki, in perhaps his final game at Safeco Field, turned a first-pitch fastball from Marshall into a leadoff homer. The crowd of 27,147 cheered loudly as Suzuki circled the bases. When the Marlins then put two runners on base against Marshall, manager Scott Servais summoned Rzepczynski for the final out. The Mariners, remember, blew a six-run lead in the ninth inning on April 9 at Anaheim. Not this time. Rzepczynski threw one pitch and got the final out. “An outstanding job by our guys to bounce back after a tough first week,” Servais said. “We knew it wasn’t going to be easy. We dug ourselves a little bit of a hole. More than a little bit. Haniger reached base in all five plate appearances and raised his average to .323. His two-run single erased a one-run deficit in the second inning, and his two-run double fueled a four-run fourth that boosted the lead to 8-4. Seager’s first RBI was a double in the third inning that broke a 3-3 tie and gave the Mariners the lead for good. He added a two-run single in the fourth and worked a bases-loaded walk in a two-run eighth inning. Miami starter Edinson Volquez (0-2) lasted just three innings and gave up runs in each of them; four in all along with five hits and four walks in a 70-pitch struggle. Dustin McGowan replaced Volquez and, with his first pitch, hit Zunino, who moved to second on Dyson’s one-out single. Both runners scored on Haniger’s two-run double into the left-center gap for a 6-3 lead. An intentional walk to Robinson Cano and a single by Cruz loaded the bases with one out for Seager, who lined a two-run single to center. Miami got one run back when Yelich opened the fifth inning with a 415-foot homer to left field when Hernandez served up a 3-1 cookie of a fastball. Next came a four-pitch walk to Stanton, who had hit a 445-foot homer to center in his previous at-bat. It is the only walk issued this season by Hernandez after 24 2/3 innings over his four starts. Stanton moved to second on a wild pitch and tried to score on J.T. Realmuto’s soft single to third when Seager tried for the out art first. Utilityman Mike Freeman, playing first, threw home of the out. That allowed the Mariners to carry a four-run lead into the later innings. PLAY(S) OF THE GAME: Prado tested Dyson after the Marlins loaded the bases with no outs in the first inning. Bour sent a fly to medium deep left field, and Prado tagged. The play wasn’t close. Dyson made an on-target throw for an easy double play, but the Marlins got even later in the inning. Dyson opened the Mariners’ first with a drive over the Yelich’s head in center field. Yelich retreated to the track, caught the ball in the heel of his glove and held on despite a face-first plant into the cushioned wall. PLUS: The Mariners’ 10 runs were a season best. Their previous best was nine – in that infamous game at Anaheim when a six-run lead in the ninth turned into a 10-9 loss…the Mariners’ two-three-four-five hitters were a combined 9 for 16 with six walks…Freeman’s throw to the plate for the final out in the fifth inning saved a run. 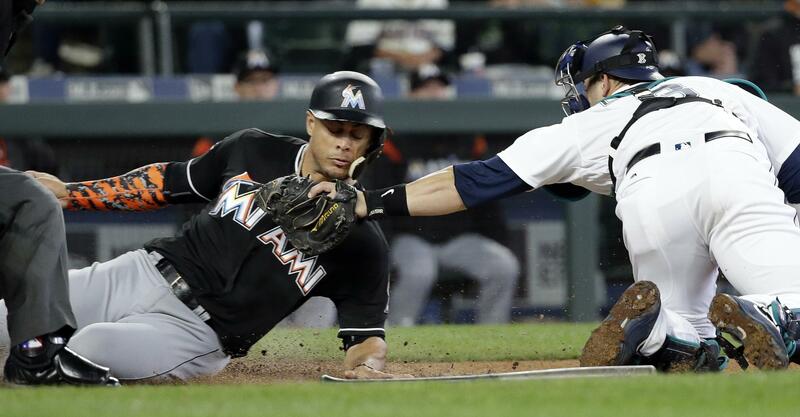 MINUS: Marshall’s shaky performance forced the Mariners to use Rzepczynski in the ninth inning…Seager got picked off second base by Realmuto in the third inning after giving the Mariners a one-run lead with an RBI double…Taylor Motter and Freeman each went hitless n four at-bats. Motter did draw a walk. STAT PACK: Suzuki went 2 for 4 with a single and a homer. He has 1,240 career hits at Safeco Field. Raul Ibanez ranks second with 505. SHORT HOPS: Haniger is climbing the Mariners’ rookie charts with his 13-game hitting streak. Only two rookies had longer streaks in the club’s 41-year history. James Jones had a 14-game run in 2014, and Suzuki had three longer streaks in 2001: 23 games, 21 games and 15 games. Published: April 19, 2017, 7:03 p.m.